Let’s be real….sometimes we eat a cupcake just for the frosting. Cake in and of itself can be boring. Yes, I know, there are some AMAZING cakes out there. But often…they are just something to put the frosting on. This is one of those times. One of those time when you wish it wasn’t shameful to stand at the kitchen counter and simply eat the frosting straight out of the bowl. Two…or three spoonfuls is necessary. To taste test. Purely taste testing purposes…. These cupcakes were at the request of a friend who requested something with chocolate and peanut butter. It’s hard to go wrong with that classic combination. The cupcakes were based off a recipe by Cupcake Project whose chickpea flour chocolate cupcake recipe I ended up halving. Leaving me with slightly dry cupcakes. Which was my mistake. Some days you forget the lessons learned from previous attempts to half a recipe. It always throws off the moisture. One day I will learn. But the recipe has great reviews, and will definitely be one that I try again in the future. Only I will actually follow the recipe next time. The frosting combines cream cheese, butter and peanut butter. I used peanut butter sweetened with honey. I would highly advise going that route. I love frostings that use as little sugar as possible, but still taste amazing. I’m not one for those bakery frostings that leave you in a sugar coma after one slice of cake. Nope. This frosting is delicious, but not overly sweet. And addicting. I had to freeze the leftovers I had so that I wouldn’t eat them. 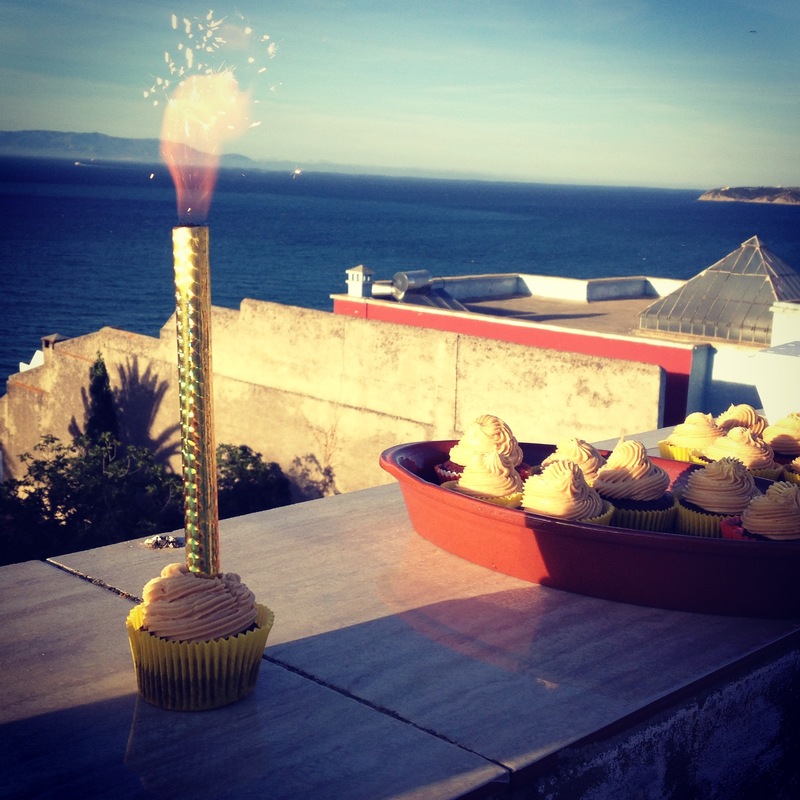 But I have been known to sneak spoonfuls of frozen frosting, so we will see how long that lasts…..
Also- if at all possible, you should serve this with an overly large candle (which may also be a firework) while having a BBQ on your roof overlooking the Mediterranean Sea. It makes them 1,000 times better. *For best results, leave your butter and cream cheese sitting out on the counter over night the night before you make the frosting. You won’t die from warm butter, and your frosting won’t be clumpy. It’s a happy thing. In a medium bowl mix butter and cream cheese together until well blended. Add in the peanut butter and honey and continue mixing until combined. Add in your vanilla and half of the powdered sugar. Once the first half of the powdered sugar is mixed in, add in 1/4 cup at a time until is reaches the desired constancy. After this step, I like to turn the mixer up and whip the frosting until it is light and fluffy. Spread, pipe or plop onto cupcakes and enjoy! these were SO GOOD. ill never hate on chickpea flour again. I know! I have fallen in love with it!